The 45th edition of the Festival of Valle d’Itria 2019 will be entirely dedicated to Paolo Grassi in the centenary year of his birth (with a series of initiatives for the occasion) and it is heralded as amongst the most lavish and interesting ever. The musical programme – once again prepared by the artistic director Alberto Triola – is entitled “Albori e bagliori. Napoli e Europa: il secolo d’oro”, or “Brilliant Dawns. Naples and Europe: the golden century”, and outlines an homage to Naples, to its school of music and to its international prestige. Domenico Cimarosa’s masterpiece, Il matrimonio segreto of 1792, will be performed at the Palazzo Ducale on 16, 20 and 31 August, as well as the lesser known Ecuba by Nicola Antonio Manfroce of 1812, on 30 July and 4 August. This last with the Festival musical director Fabio Luisi at the podium. The staging for both pieces will be entrusted to one of the great masters of Italian theatre, Pier Luigi Pizzi, whose signature style is deeply allied to the ideal of “beautiful simplicity” which both distinguishes Classicism and draws from that most precious heritage. At the same scenario which is to welcome the two works at the Palazzo Ducale, a third work – in semi-scène format – will be staged; Orfeo, a pastiche by the Neapolitan Nicola Porpora (2 August). 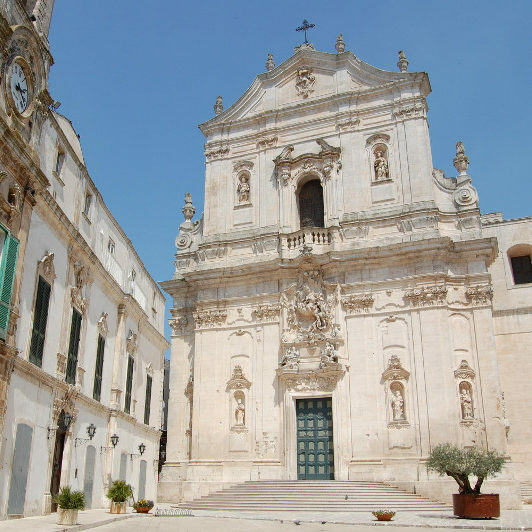 The Neapolitan context also entertains due to the most valued initiative of the “Opera in Masseria”, with as “intermezzo napoletano” by Leonardo Vinci, which will be staged in various locations for 5 evenings (21, 23, 25, 27, July and 1 August). The students of the Academy of Belcanto “Rodolfo Celletti” on the other hand, will be players in an arts project completely devised by themselves. Also confirmed for 2019, the Junior Festival initiative, an appointment with sacred music in the Basilica di San Martino, and the “Rodolfo Celletti” prize award, now in its tenth edition. “We come to the 45th edition of the Festival of the Valle d’Itria”, the President, Franco Punzi adds, “in full compliance with statutory ideals which require the promotion of young artists, the real mainstay behind programming the festival, and the rediscovery of unknown or forgotten works of the Belcanto repertoire. Furthermore, all this is allied to the resources of the territory and an appreciation of the cultural assets of our region, elements which fulfil the expectations of our supporting bodies. Producing culture through performances and satisfying the requirements of an ever more involved public is the commitment of an articulate and punctual festival which adheres to the insight of Paolo Grassi, originally from Martina Franca, whose birth centenary falls on this year. Alberto Triola, artistic director, summarises the 45th Festival of the Valle d’Itria as follows: “The 2019 playbill frames the magnificent arc of a golden century, from Vinci and Porpora to Cimarosa and Manfroce, that is to say, from the imaginative dawning of the Neapolitan school to the amazing flashes of brilliance which illuminate the musical sky of half of Europe (London, Saint Petersburg, Vienna, Paris…), down to the good natured afterglows, shimmering in melancholy which, over the whole eighteen hundreds, continued to recount the surprising history of a glorious musical tradition and its immortal players. Successful composers whose works, often unequalled masterpieces, have become an example, cast in literature and, in some cases, a legend”.